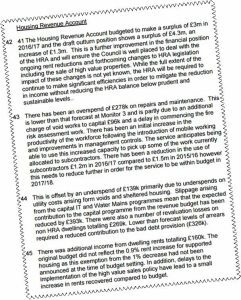 Hidden away in the York Council’s accounts is an admission that the 2016/17 in year surplus on its housing revenue account was £4.3 million. That is much higher than the budgeted figure (£3 million). Officials continue to parrot familiar justifications for the profit. These include a bogus assumption that the present governments rent reduction formulae will continue (a ploy aimed at reducing the central housing benefit bill) and even mention the now discredited proposal to sell off high value Council houses. The latter was kicked into the long grass even before the Tories suffered their General Election setback. So, does it matter that the surplus on the housing account is relatively high now standing at £22.7 million? It certainly does to tenants. The report to the Council’s Executive also confirms that there have been delays in updating fire assessment work – an uncomfortable admission after recent events in London and confirmation of what we found when visiting some flats last weekend.